Matchbook is an online betting exchange designed for professional sports traders looking to maximise their value and for bettors who want the purest online betting experience. Matchbook has been in operation since 2004. In 2011 it was acquired by a group of investors with backgrounds in the UK sports wagering and banking sectors. With new financial backing, Matchbook has been making great strides in the online betting community and is looking to challenge some of the industry norms. 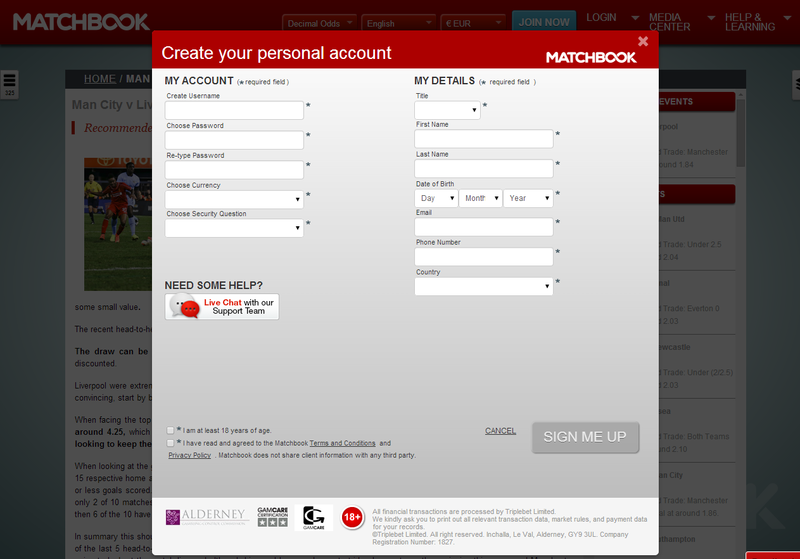 Signing up to Matchbook is quick and easy. 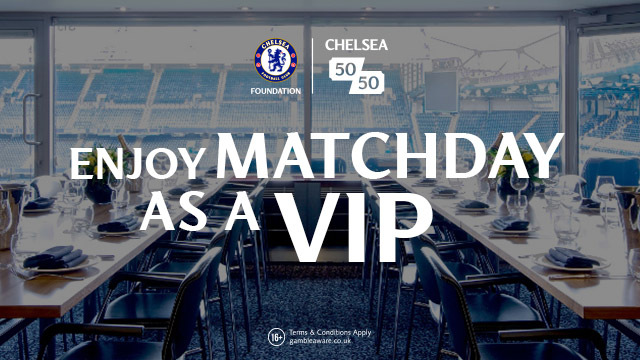 However, there are some restrictions and US customers cannot bet with Matchbook. Matchbook are now offering a bonus offer for new sign-ups - a £25/€25 Risk Free Bet. To qualify for a risk-free bet, customers have to place their first bet at odds of 2.50 or greater, or a lay bet at minimum odds of 1.67. Should the initial bet lose, Matchbook will credit a customers account with a free bet within 72 hours of the qualifying bet being settled. Free bets must be rolled over 3 times before funds can be withdrawn. Commission Charge: 1% (All Sports). By charging a small 1% on commission, Matchbook restores maximum value to the punter and provides an authentic exchange betting experience. This commission rate will be applied to the win amount on winning bets. For losing bets, commission will be applied to the lesser of the stake or potential win amount. 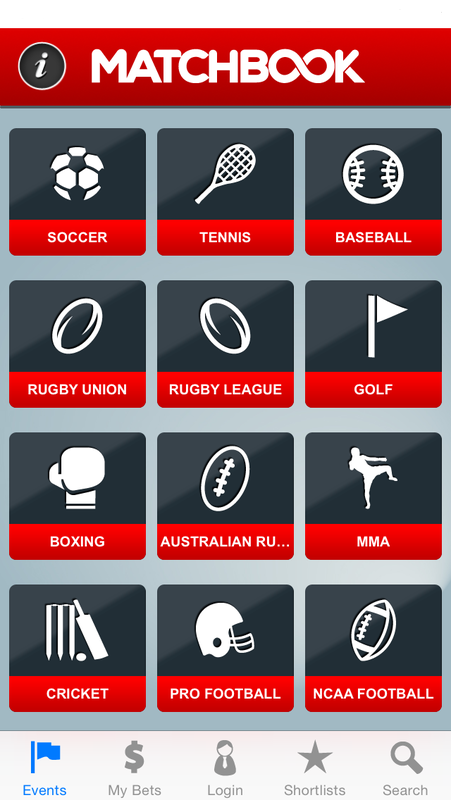 Markets Offered: Soccer, Tennis, Baseball, Rugby Union, Rugby League, Golf, Boxing, Australian Rules, MMA, Cricket, NFL, NCAA Football, Basketball, NHL, NCAA Basketball. 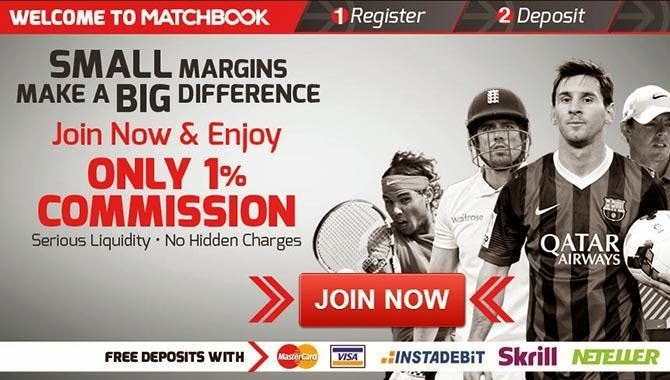 Matchbook offers all major sports and generally offers the big soccer, tennis, and cricket matches for live betting. While their live markets are not as numerous as their competitors, they are focused on delivering good prices and liquidity on the markets that they do offer. The liquidity in their US sports markets is a particular highlight. Payment Options: Skrill, Neteller, Wire Transfer, Credit Card, Debit Card, InstaDebit. Odds Format Options: : US, Decimal, Hong Kong, Malaysian, Indonesian, % Odds. Users can download Matchbook’s free app on iOS and Android which features every market that is available on the main website. Users can create shortlists of their favourite markets for quick access. The app offers the full exchange experience to the user, including deposits and withdrawals. New accounts can be registered for entirely through the mobile app. Twitter Service: You can also tweet @TeamMatchBook if you have any questions or problems. 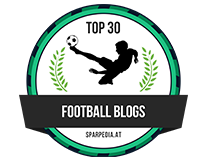 The Twitter account live tweets around big sporting events with offers, betting analysis and betting previews from their tipster @petenordsted.